All the Gail Carriger books I've read were read before I started really getting into book blogging, so I don't have any previous reviews for you, but suffice it to say that she is one of my favorite writers. Quick summary of the series (since this is my first time actually writing up one of Gail's books on my blog): Sophronia Temminnick, who doesn't seem to fit in with proper London society, is enrolled by her frustrated mother in Mademoiselle Geraldine's Finishing Academy for Young Ladies of Quality. Little did Mrs. Temminnick know, this Finishing School also teaches young ladies to FINISH people, in the Mortal Kombat sense of the word - the graduates can not only throw a proper tea party, but they can also maim, poison, seduce, infiltrate, and fight. In short, they are trained to be intelligencers and assassins, and Sophronia takes to her new training like a duck to water. Proving herself to be one of the school's top pupils, Sophronia also uncovers a conspiracy that will test everything she's learned. 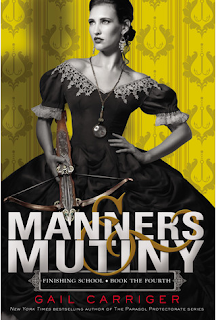 This series takes place in the same universe as Gail Carriger's Parasol Protectorate series (but approximately 30 years before that one), so you can also expect that there are vampires, werewolves, dirigibles, and lots of tea. Also, you will recognize many of the same characters, which is awesome. Summary of this book: This is the fourth and final book of the Finishing School series, and thus, my review contains spoilers of the first three books. If you don't want to be spoiled, you can scroll to my "Thoughts" below, which are spoiler-free. The holidays form the main setting for Mademoiselle Geraldine's girls as they excited to host a ball and a New Year's tea party with the local boy's school for Evil Geniuses. But as Sophronia learns that the Picklemen have been sneaking in spies, she must put her skills to use to protect her school and to foil their plan. There is a lot to love about this series - witty writing, steampunk and supernatural universe, clever and strong female characters, an interracial love story, and lots of ladies' accessories disguising deadly weapons. It's funny, it's warm, and it's highly fashionable. What's not to love? I did find myself feeling wistful and wondering what will happen next with Sophronia, but the Epilogue drops a major, major hint about where the road takes her... which means I will definitely have to revisit the Parasol Protectorate books with a fresh new perspective after having read this one. What else can I say? I love this series. I love this story universe. I love Gail Carriger's books.